Kids and Composting: Hands-on Teaching Tool to Teach the Environment! Kids and composting are an unlikely match; but we argue that composting is an awesome science experiment that can teach kids a lot. Children learn about the earth through gardening, and the same is true with composting. Make composting for kids a hands-on science experience! Composting for Kids: What Do They Learn? 1. Gardening and composting teaches kids how the environment works and how to reduce our waste! Composting helps kids understand the three environmental r’s (recycle, reuse and reduce). Children learn the difference between biodegradable products and what ends up in our landfill. Kids learn what waste can be converted into compost. You can turn collecting leaves into a game or involve your kids in the kitchen by teaching them what kitchen scraps to save for compost. 2. Composting is a great way to introduce kids to the environment by teaching them how to convert waste into nutrient-rich soil. It gives kids an appreciation for the Earth and the life cycle. They’ll learn how different materials breakdown by understanding the chemical process. Kids learn biology, chemistry and physics through composting. They even learn how temperature works in the decomposition process. Composting is a great teaching tool! 3. Kids learn the importance of worms and slugs and their value to our ecosystem. The will see firsthand how microorganisms work to give us rich soil for food production and that even the smallest animals have important roles in our ecosystem. Composting gives them a new appreciation for nature. Composting is really for anyone, anywhere. Even if you live in the city, you can compost! It’s great for the environment and helps reduce waste that heads to our landfills. 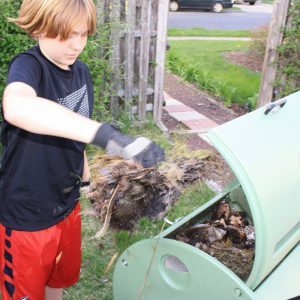 Continue the tradition of composting by teaching its value and benefits to our kids. Check out this cool video from Chaotically Creative below for more information!